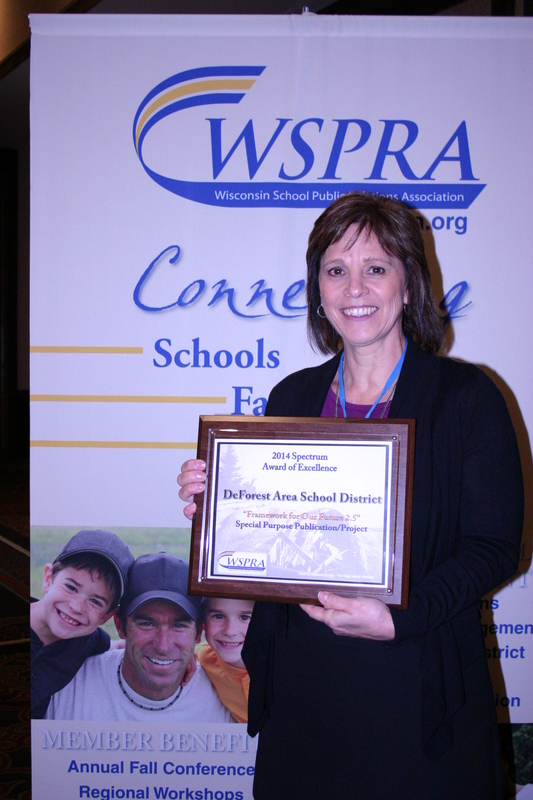 The DeForest Area School District was recently honored by the Wisconsin School Public Relations Association (WSPRA) with a Spectrum Award of Excellence for its work in school communications. School/Community Relations Coordinator Debbie Brewster submitted the entry for consideration and accepted the award on behalf of the District. WSPRA presented the Spectrum Awards at its recent annual conference in Elkhart Lake, Wis. The DeForest Area School District earned an Award of Excellence for its Framework for Our Future 2.5 conference, held in February 2014. The conference brought together over 100 individuals representing local community members, parents, students, teachers, business, government, senior citizens, and other stakeholders to learn about the district’s progress since 2009 and provide input about the vision for our schools. Spectrum Awards recognize high-quality public relations efforts produced by or on behalf of Wisconsin school districts. This year, this statewide competition honored 23 school districts with awards. WSPRA’s Spectrum Awards are judged by the Illinois School Public Relations Association (INSPRA) on a four-point scale in four areas: goals and objectives, research and planning, execution and evaluation and results. The Wisconsin School Public Relations Association (WSPRA) is a professional association representing schools, school districts, educational associations, consulting agencies and organizations. WSPRA is a state affiliate of the National School Public Relations Association (NSPRA). The mission of WSPRA is to expand the capacity of its members to provide effective communication management for the purpose of strengthening educational opportunities for all students.